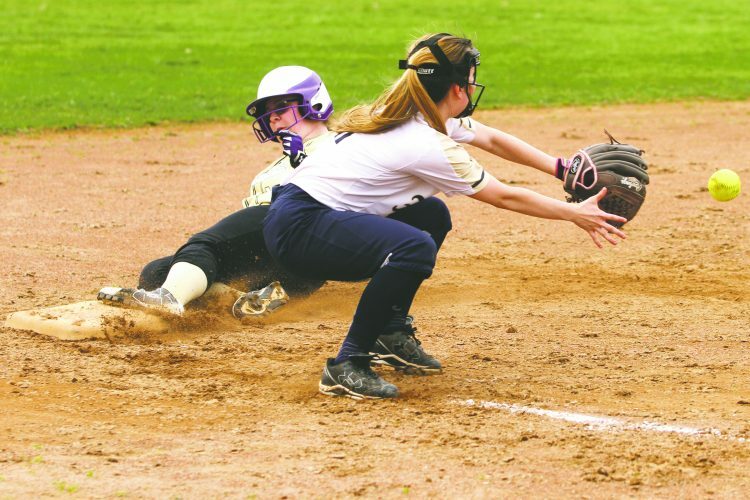 OBSERVER Photo by Lisa Monacelli Cassadaga Valley third baseman Brittyn LeBaron tags Chautauqua Lake baserunner Cameryn Hawkins after Hawkins was caught in a run down. A pitchers’ duel commenced at Promenschenkel Stadium in Dunkirk between Chautauqua Lake’s Olivia Anderson and Cassadaga Valley’s Alyssa Hahn to decide who would be Section VI Class C1 softball champion. The game came down to the final moments, but the Lady Thunderbirds prevailed over the Lady Cougars, 2-0, to win the Sectional title. Olivia Anderson was the winner in the circle for the Lady Thunderbirds. After hitting the first two batters she had faced, Anderson dazzled the rest of the way. She finished the entire game and allowed just two hits and two walks while racking up 14 strikeouts in the championship effort. Anderson was backed up by Lakin Gustafson, who had a 2-for-3 effort with a double at the plate. Katelyn Fardink had two singles, and both Cameryn Hawkins and Anderson had crucial RBI singles in the win by Chautauqua Lake. Alyssa Hahn had a complete game for the Lady Cougars, and pitched admirably from the circle. In her effort, she gave up only two runs on seven hits, two walks and totaled nine strikeouts for the day. The game was tied, 0-0, until the top of the sixth inning. Chautauqua Lake’s Katelyn Fardink hit her second single of the day to lead off the inning for the Lady Thunderbirds. At the next at-bat, Fardink moved to second on a Chadelynn Johnson groundout and then benefited from a wild pitch moving her to third. Next up was Anderson, and in a clutch moment, she slammed an RBI single down the third base line to score Fardink and give the Lady Thunderbird’s the lead at 1-0. The Lady Cougars would mount an attack of their own in the sixth. Brittyn LeBaron reached first on a walk, and then moved to second on a wild pitch by Anderson. With one out, and a runner in scoring position, Anderson left the next two batters fanning, getting Chautauqua Lake out of the inning. In the top of the seventh, Gustafson led off with a single and moved to third via a groundout and a wild pitch. Hawkins brought Gustafson home with an RBI single to build the lead up to 2-0. The Lady Cougars found themselves down, but they were certainly not out. Mikayla Rearick and Jenna Caskey belted consecutive singles against Anderson to open up the bottom of the seventh. After a couple of miscues by Chautauqua Lake, Anderson found with the bases loaded with two outs facing the top of the order. Then it was Hahn versus Anderson, and with the game on the line, someone had to deliver. 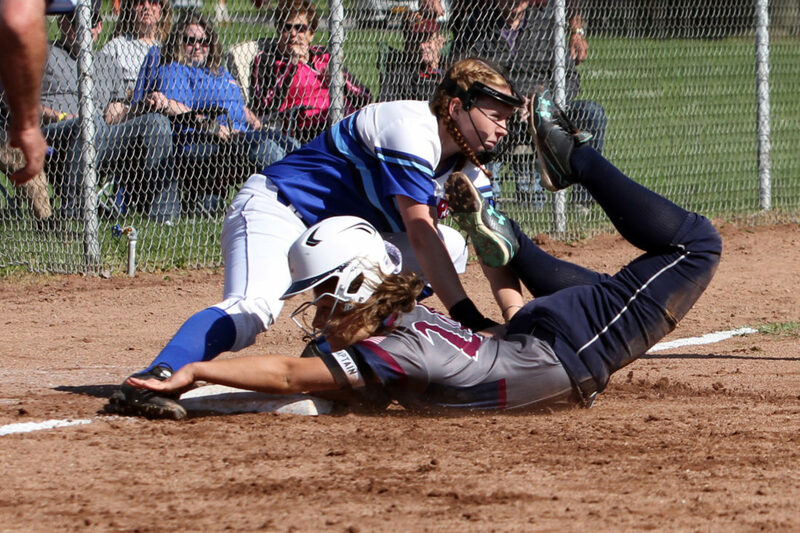 Anderson beat Hahn at the plate, striking her out in winning-time to take the Sectional title for Chautauqua Lake. Chautauqua Lake now moves on to the Section VI Class C title game against Portville. Regardless of the opponent, Chautauqua Lake is ready for the challenge. The Section VI Class C title game will be held on Tuesday, May 30 at Promenschenkel Stadium in Dunkirk.